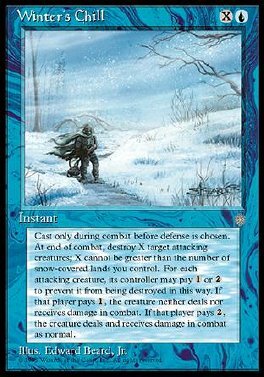 Play Winter's Chill only during combat before the declare blockers step. X can't be greater than the number of snow lands you control. Destroy X target attacking creatures at end of combat. For each attacking creature, its controller may pay 1 or 2 to prevent this effect. If that player pays only 1 for that creature, prevent all combat damage that would be dealt to and dealt by that creature this turn.